One of the things which is perceived as a stumbling block to using Linux as a designer’s platform is the lack of font management tools. Most graphics professionals started or at some time worked on a Mac and often enough MacOS 9 or earlier. So, while font management is nowhere as difficult on Linux as it might be assumed since the arrival of Keith Packard’s fontconfig, it is a perception thing. Moreover, KDE3 for a while, now has a simple and very effective font manager/installer called Kfontinstaller. I have commented elsewhere that I think it is the simplest and most user GUI friendly font manager on any platform. 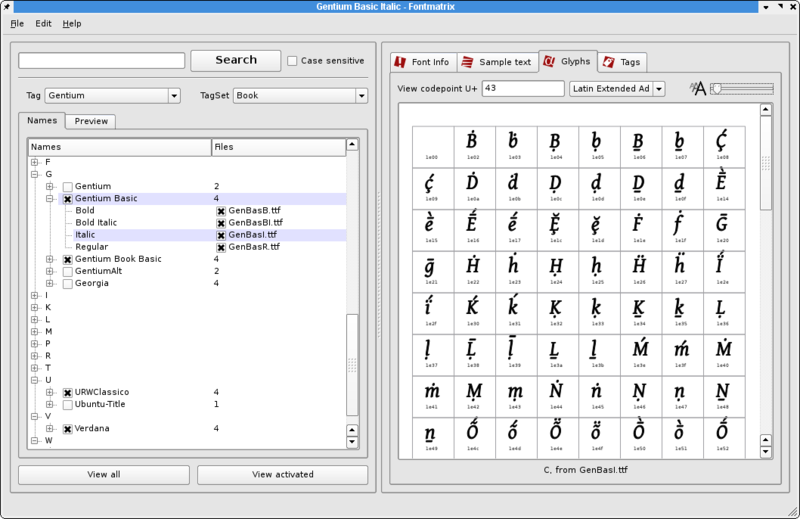 It is a font manager with no extra bells and whistles. To boot, Linux can run with lots of fonts installed with no large performance hit – unlike earlier graphics apps and older Windows versions. Getting back to Macs, and in my experience with production workstations on Win32 , a 100% certainty was the need for a third party font manager. Most of the time either Suitcase or ATM sufficed. They made it manageable to use and select from more than a few hundred fonts. Plus, fonts on pre-OSX Macs had a nasty tendency to corrupt themselves every once and a while. Most of the older font managers had tools to try and fix this too. Something which one should never worry about happening on Linux. 😉 As you can imagine over time doing layout professionally you tended to end up with hundreds if not thousands of fonts installed. Not good for performance and a nightmare to manage without third party tools. One thing where Fontmatrix has the older proprietary managers beat is the concept of ‘tagging’. This makes it really nice to group fonts and even sub-group them logically for use in say a book. It also has extensive support to give you a nice gui to show all the glyphs in a font, previews of sample text, variable sizing and also tell you what kinds of advanced Open Type features are inside the guts of your font. That is something I’ve never seen outside of a font editor. And not least, it creates a nice PDF catalogue of your fonts for printing or reference. All in all, a real pro’s font manager, but still nice and user friendly. Fontmatrix is still young, but it does not crash for me and it works really well already. For installing ease, I have packaged it for Suse 10.2+ and Fedora 8 on the OpenSuse Build Service which I have talked about before. Enjoy.